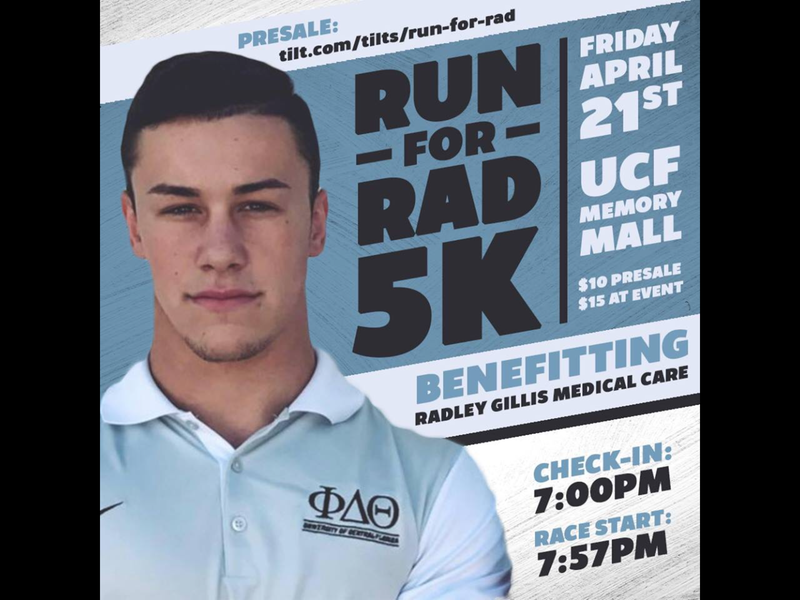 On Friday April 21st from 7pm-9pm, Phi Delta Theta will host a fundraiser for UCF student Radley Gillis called “Run for Rad”. On April 4th, Radley got in a horrific motorcycle accident on the 408 leading to Research Park and he has had several major surgeries. A GoFundMe for Gillis has raised $93,000 dollars. Gillis had tens of thousands being raised in a matter of hours. The 5k will take place on campus at Memory Mall. All proceeds will be given to the Gillis family to help Radley’s medical care. Presale tickets are $10 and can be bought here or by emailing kbrjr4@gmail.com. The day of the event there will be a check in tent to give wristbands and bib numbers to those participating. Tickets will also be sold for $15 on the day of the event.